1. Define the term "weed." 2. Describe several specific ways in which a lack of weed control causes a reduction in yield and/or quality in forage crops. 3. Define Integrated Pest Management. 4. Define the following terms as they apply to weed life cycles: annual, perennial, and biennial. 5. 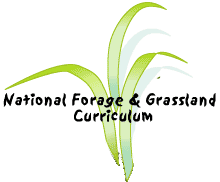 Discuss how a knowledge of weed life cycles can be applied in weed control in forages. 6. Describe how you would manage weeds in alfalfa establishment. 7. List several printed and electronic sources of weed control information.